Welcome to the ATV and ORV Information Center for Newberry, MI. Book online with Quality Inn and Suites to begin your adventure in the Upper Peninsula of Michigan. 73% of the system is on State of Michigan Forests, 40% is cycle trail, 43% is ATV trail, and 17% is route. 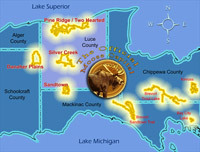 In the Upper Peninsula of Michigan there area a vast amount of trails (see map below). The ATV and ORV activities are becoming more and more popular. We ask that everyone please stay on the trail to preserve our beautiful terrain that we all enjoy so much. Please adhere to the rules and use the links below to find out more about this activity. >>Click Here for General Information on Riding In Michigan. >>Click Here for Information on your E-License for ATV and ORV . Click the image to the right for an easy to browse map of the Eastern Upper Peninsula and our locations for All Terrain or Off Road maps - these go directly to the Michigan Department of Natural Resources Maps. Please contact us with any questions, comments or package details.